RBI Governor Urjit Patel (file photo). The RBI, in its Monetary Policy review released on December 6, 2017, raised the inflation forecast for remainder of the current financial year to 4.3-4.7 per cent. The Monetary Policy Committee of the RBI has decided to maintain status quo and keep its key interest rate, the repo rate, unchanged at 6%. It had last cut rates by 25 bps four months earlier in its August review. Consensus estimates predicted a status quo policy and it was on expected lines. The six member monetary policy committee voted on the basis of a majority for a pause. Dr. Chetan Ghate, Dr. Pami Dua, Dr. Viral V. Acharya, Dir Michael Patra and Dr. Urjit R. Patel were in favour of status quo while Dr. Ravindra H. Dholakia voted for a policy rate reduction of 25 basis points. This was on the same lines as the previous policy. The Sensex fell 219 points or 0.67 per cent to 32,583.82 at about 2.40 pm. Similarly, the NSE Nifty too slumped 71.15 points or 0.70 per cent to 10,047.10. The RBI retained its GDP projections for the year at 6.7 per cent with risks evenly balanced. It noted that Q2 growth which rebounded to 6.3 per cent from 5.7 per cent earlier, was lower than projected in the October review. It said that the recent increase in oil prices may have a negative impact on margins of firms and GVA growth. It said, "Shortfalls in kharif production and rabi sowing pose downside risks to the outlook for agriculture. On the positive side, there has been some pick up in credit growth in recent months. Recapitalisation of public sector banks may help improve credit flows further. While there has been weakness in some components of the services sector such as real estate, the Reserve Bank’s survey indicates that the services and infrastructure sectors are expecting an improvement in demand, financial conditions and the overall business situation in Q4." RBI Governor Urjit Patel today said the central bank was working with the Government on recapitalisation bonds. He added that bank recapitalisation is not just fund infusion but reforms of state-run banks as well. On inflation outlook, the RBI projected that it would be in the region of 4.3% to 4.7% in Q3 and Q4 this fiscal. 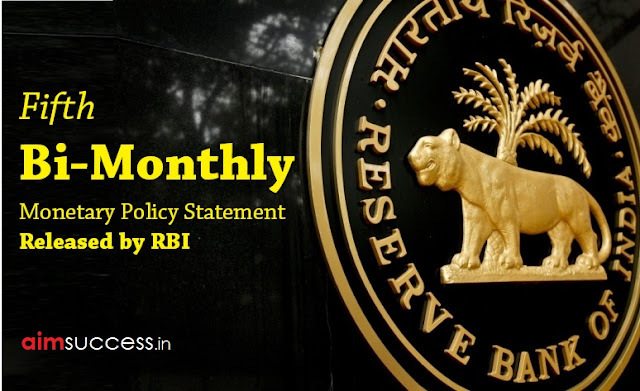 Explaining its rationale, the RBI noted that moderation in inflation excluding food and fuel observed in Q1 of 2017-18 has, by and large, reversed and said that there is a risk that this upward trajectory may continue in the near-term. It said that the impact of HRA increase by the Central Government is expected to peak in December. The staggered impact of HRA increases by various state governments may push up housing inflation further in 2018, with attendant second order effects. Third, the RBI noted that the recent rise in international crude oil prices may sustain, especially on account of the OPEC’s decision to maintain production cuts through next year. Some relief on vegetable prices was anticipated due to seasonal moderation as winter kicks in. The RBI also noted that the GST Council in its last meeting has brought several retail goods and services to lower tax brackets, which should translate into lower retail prices, going forward. The RBI said that in recent times, debit card transactions at ‘Point of Sales’ have shown significant growth. With a view to giving further fillip to acceptance of debit card payments for purchase of goods and services across a wider network of merchants, it has been decided to rationalise the framework for Merchant Discount Rate (MDR) applicable on debit card transactions based on the category of merchants. A differentiated MDR for asset-light acceptance infrastructure and a cap on absolute amount of MDR per transaction will also be prescribed. The revised MDR aims at achieving the twin objectives of increased usage of debit cards and ensuring sustainability of the business for the entities involved. The revised instructions for MDR on debit card transactions will be issued today. Currently, Indian corporates are permitted to refinance their existing External Commercial Borrowings (ECBs) at a lower all-in-cost. The overseas branches/subsidiaries of Indian banks are, however, not permitted to extend such refinance. In order to provide a level playing field, the RBI said that it has been decided, in consultation with the Government, to permit the overseas branches/subsidiaries of Indian banks to refinance ECBs of AAA rated corporates as well as Navratna and Maharatna PSUs, by raising fresh ECBs. Revised guidelines will be issued within a week, the RBI said.